Otherwise known as otitis externa, swimmer’s ear is an infection of the outer ear and ear canal, which is a tube that connects the outer ear to the eardrum.For most people, the intricate design of the ear protects them from this condition and exposure to water is not problematic. This condition normally, but not exclusively, occurs in those who spend prolonged amounts of time in water and commonly affects those who participate in water sports, or children who go swimming a lot, especially those who live in warmer climates.The continued exposure to water causes the moisture to weaken and sometimes split the delicate lining of the ear canal, which leaves the area susceptible to infection. Bacteria and fungus can then penetrate the tissues and an infection can develop. Other causes include eczema, whereby the skin of the lining can become dry and cracked, those who use an implement to clean the deeper anatomy of the ear or by the introduction of a foreign body.Though quite rare, an untreated infection of the outer ear can also allow for fluid and infection to build-up, with the possibility of the pressure causing perforation of the tissues of the ear canal.If the infection continues to develop, the eardrum can perforate and the middle ear can become infected also. This condition can begin by feelings of irritation of the ear canal as the skin becomes inflamed. This can lead to earache and pain, which can invade the surrounding tissues resulting in redness and tenderness.As the infection develops, a high temperature may follow along with headaches, a general feeling of being unwell, discharge from the ear and disturbances in hearing ability. Eardrops containing anti-biotic drugs are often the only treatment needed, or possibly an oral preparation will be used. The symptoms should subside after 7 – 10 days, but the full course of treatment should be taken or used.Occasionally a steroid based cream or eardrop may be needed along with pain relief if pain levels cannot be tolerated.If the infection has caused a build-up of fluid or pus, a specialist ear doctor may suggest trying either suction or irrigation as a way of eliminating the fluid. Always encourage natural water drainage of the ears after bathing or swimming by tilting the head to one side for a few moments and allowing gravity to take effect. The use of a towel or absorbent cloth to be used around the external ear will help to avoid water from entering the ear after finishing water based activities. Only use earplugs after medical advice has been sought. Encourage your child to take regular breaks from swimming, even if only for a few minutes to allow for water to drain and ears to dry out. 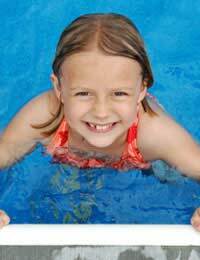 Make sure the swimming pool chosen follows regulatory guidelines for sanitation and chemical content of the water. Ensure that you have full travel insurance when going on holiday as this is when many children will pick up an ear infection. Swimmer’s ear, is usually fairly harmless and if treated, will leave no lasting effects.Prevention is always better than cure, so please follow advice accordingly.